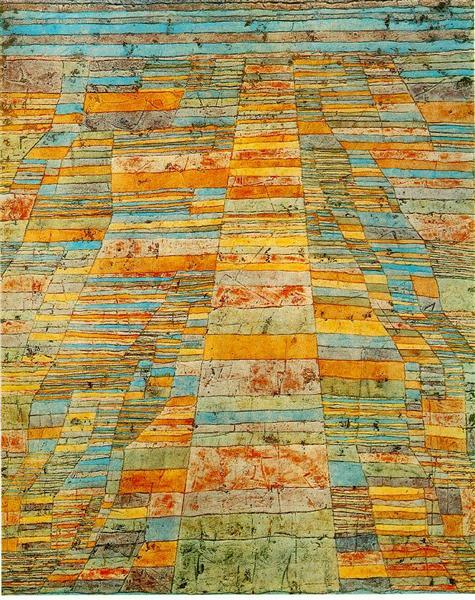 Twittering Machine (Die Zwitscher-Maschine) is a 1922 watercolor and pen and ink oil transfer on paper by Swiss-German painter Paul Klee. 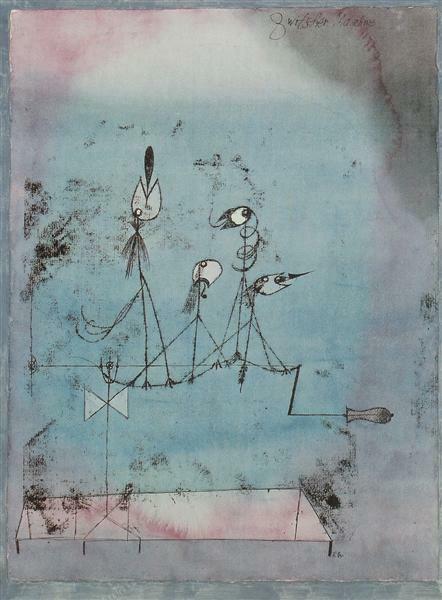 Like other artworks by Klee, it blends biology and machinery, depicting a loosely sketched group of birds on a wire or branch connected to a hand-crank. Interpretations of the work vary widely: it has been perceived as a nightmarish lure for the viewer or a depiction of the helplessness of the artist, but also as a triumph of nature over mechanical pursuits. 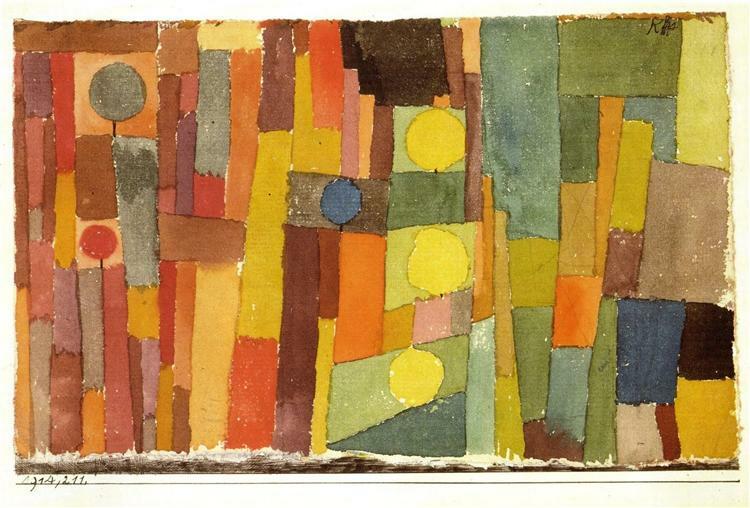 It has been seen as a visual representation of the mechanics of sound. 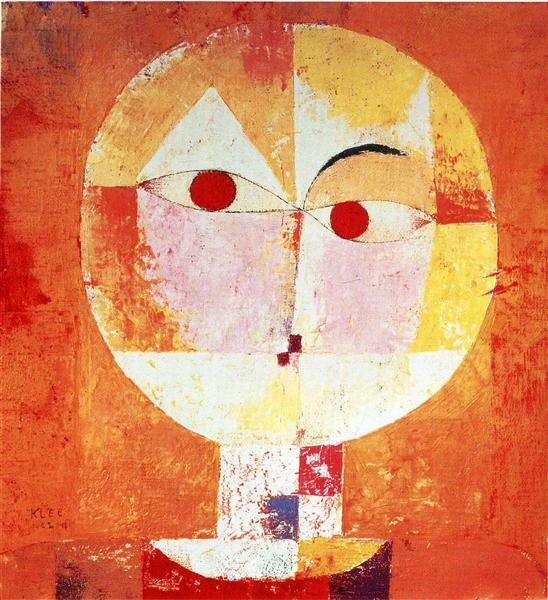 Originally displayed in Germany, the image was declared "degenerate art" by Adolf Hitler in 1933 and sold by the Nazi party to an art dealer in 1939, whence it made its way to New York. 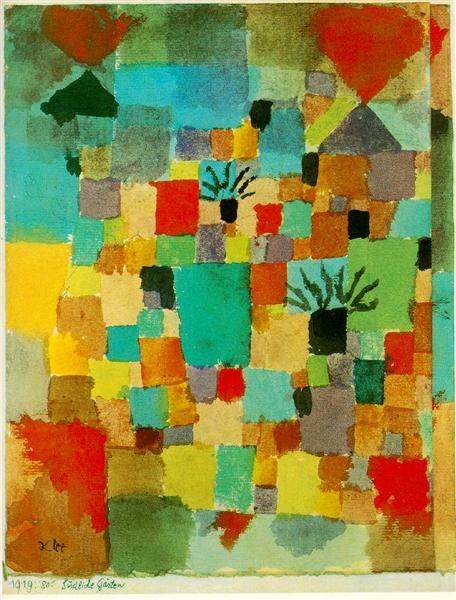 One of the better known of more than 9,000 works produced by Klee, it is among the more famous images of the New York Museum of Modern Art (MoMA). It has inspired several musical compositions and, according to a 1987 magazine profile in New York Magazine, has been a popular piece to hang in children's bedrooms. The picture depicts a group of birds, largely line drawings; all save the first are shackled on a wire (or, according to The Washington Post, a "sine-wave branch") over a blue and purple background which the MoMA equates with the "misty cool blue of night giv[ing] way to the pink flow of dawn". Each of the birds is open-beaked, with a jagged or rounded shape emerging from its mouth, widely interpreted as its protruding tongue. The end of the perch dips into a crank. 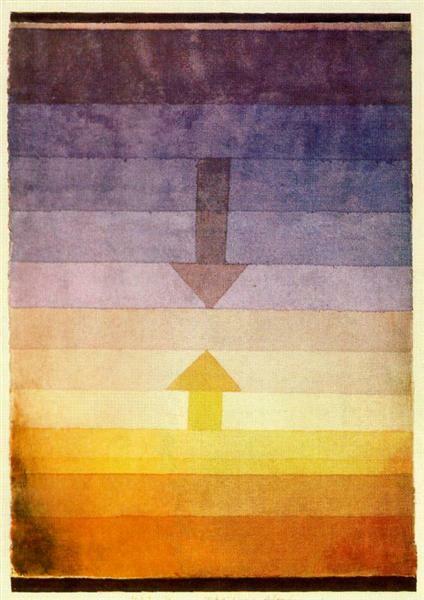 Twittering Machine has invited very different opinions on its meaning, which Gardner's Art Through the Ages (2009) suggests is characteristic of Klee's work: "Perhaps no other artist of the 20th century matched Klee's subtlety as he deftly created a world of ambiguity and understatement that draws each viewer into finding a unique interpretation of the work." 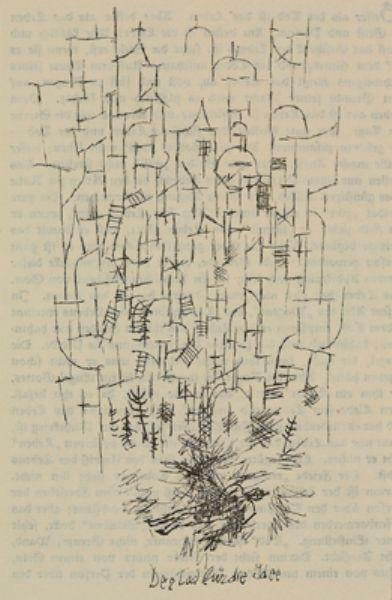 The image has frequently been perceived as whimsical, with a 1941 article in The Hartford Courant describing it as "characterized by the exquisite absurdity of Lewis Carroll's "Twas brillig and the slithy toves" and The Riverside Dictionary of Biography placing it in "a very personal world of free fancy". Sometimes, the image is perceived as quite dark. MoMA suggests that, while evocative of an "abbreviated pastoral", the painting inspires "an uneasy sensation of looming menace" as the birds themselves "appear closer to deformations of nature". They speculate that the "twittering machine" may in fact be a music box that produces a "fiendish cacophony" as it "lure[s] victims to the pit over which the machine hovers". Kay Larson of New York magazine (1987), too, found menace in the image, which she describes as "a fierce parable of the artist's life among the philistines": "Like Charles Chaplin caught in the gears of Modern Times, they [the birds] whir helplessly, their heads flopping in exhaustion and pathos. One bird's tongue flies up out of its beak, an exclamation point punctuating its grim fate—to chirp under compulsion." 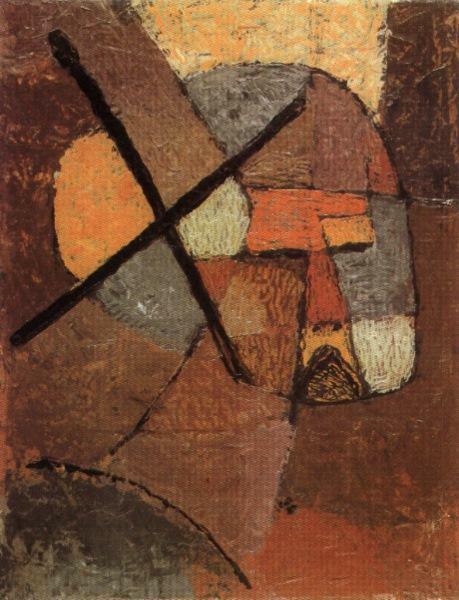 Without drawing conclusions on emotional impact, Werckmeister, in 1989's The Making of Paul Klee's Career, sees a deliberate blending of birds and machine, suggesting the piece is part of Klee's general interest in "the formal equation between animal and machine, between organism and mechanism" (similar to the ambiguity between bird and airplane in a number of works). According to Wheye and Kennedy (2008), the painting is often interpreted as "a contemptuous satire of laboratory science". 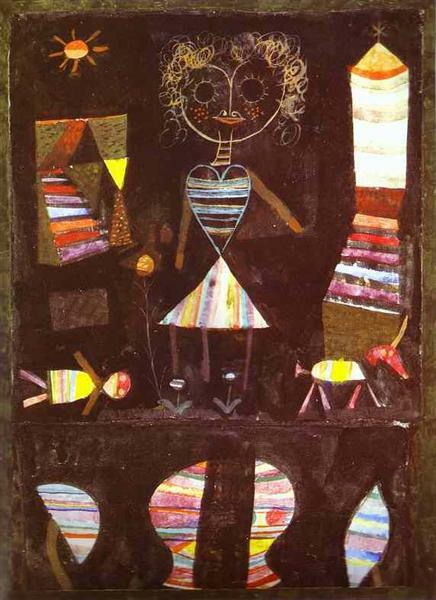 Arthur Danto, who does not see the birds as deformed mechanical creatures but instead as separate living elements, speculates in Encounters & Reflections (1997) that "Klee is making some kind of point about the futility of machines, almost humanizing machines into things from which nothing great is to be hoped or feared, and the futility in this case is underscored by the silly project of bringing forth by mechanical means what nature in any case provides in abundance." Danto believes that perhaps this machine has been abandoned, the birds opportunistically using it as a perch from which they issue the sounds the inert machine is failing to produce. 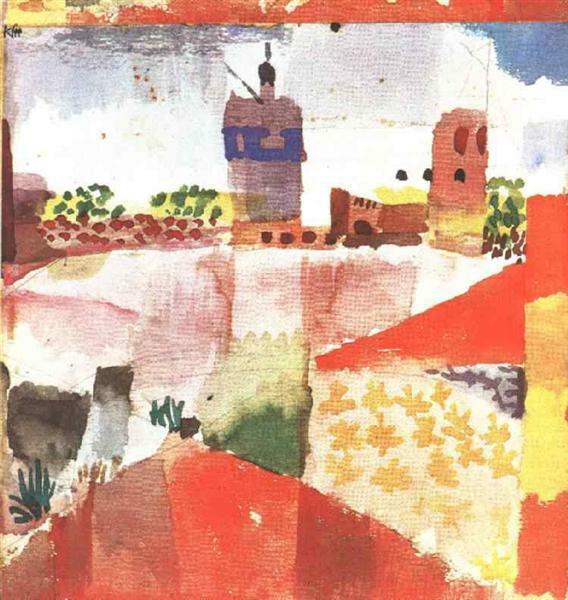 Danto also suggests, conversely, that the painting may mean simply that "it might not be a bad thing if we bent our gifts to the artificial generation of bird songs." 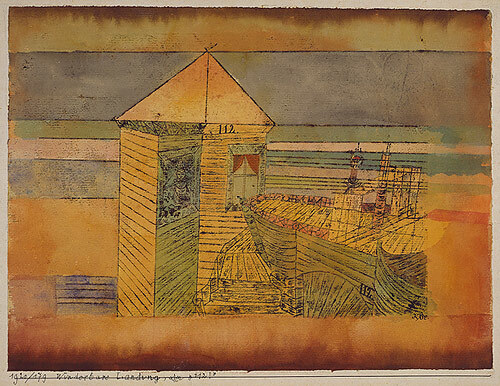 Twittering Machine (Die Zwitscher-Maschine) is a 1922 watercolor and pen and ink oil transfer on paper by Swiss-German painter Paul Klee. 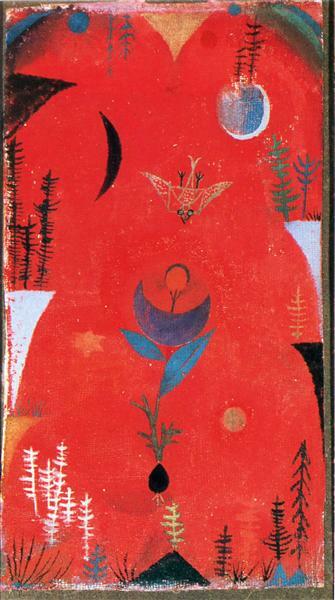 Like other artworks by Klee, it blends biology and machinery, depicting a loosely sketched group of birds on a wire or branch connected to a hand-crank. 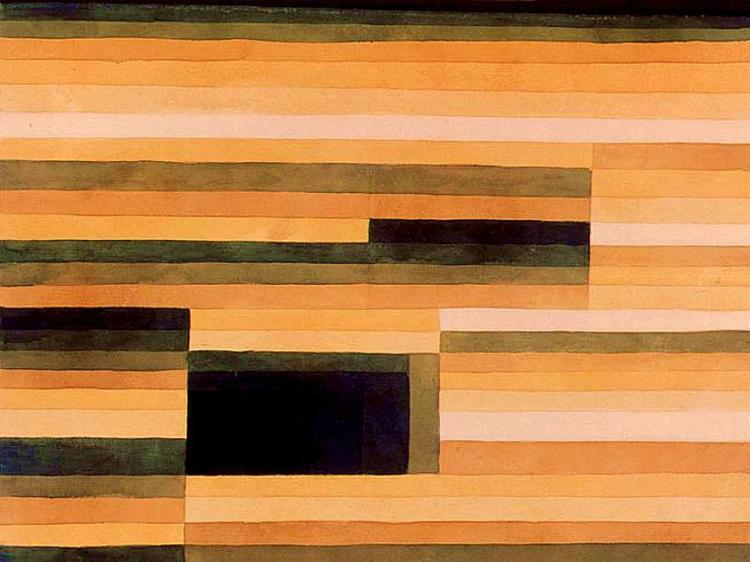 Interpretations of the work vary widely: it has been perceived as a nightmarish lure for the viewer or a depiction of the helplessness of the artist, but also as a triumph of nature over mechanical pursuits. 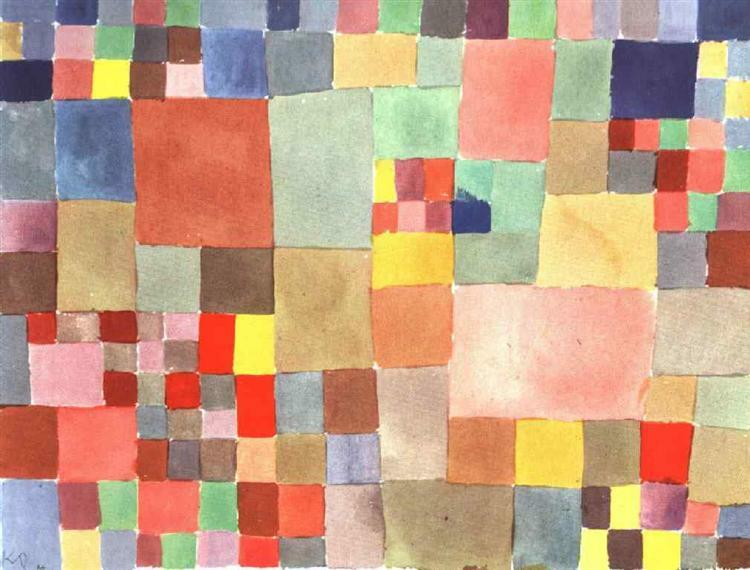 It has been seen as a visual representation of the mechanics of sound. 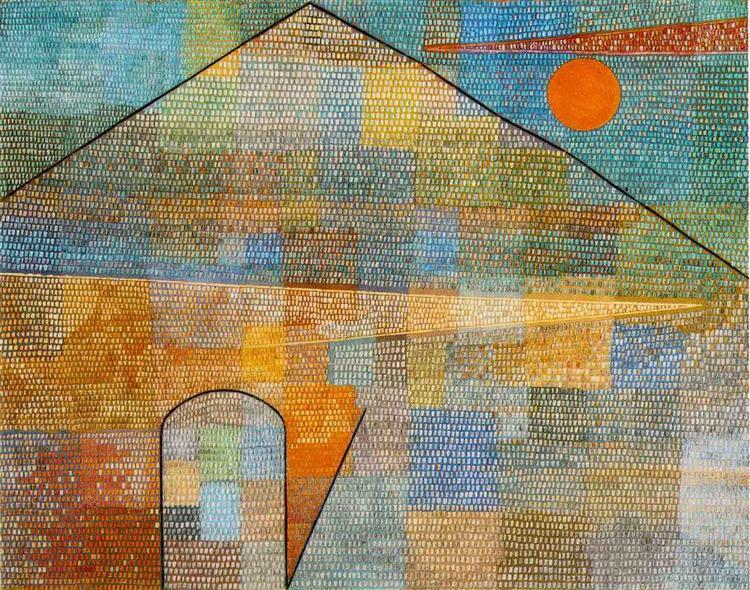 Originally displayed in Germany, the image was declared "degenerate art" by Adolf Hitler in 1933 and sold by the Nazi Party to an art dealer in 1939, whence it made its way to New York. 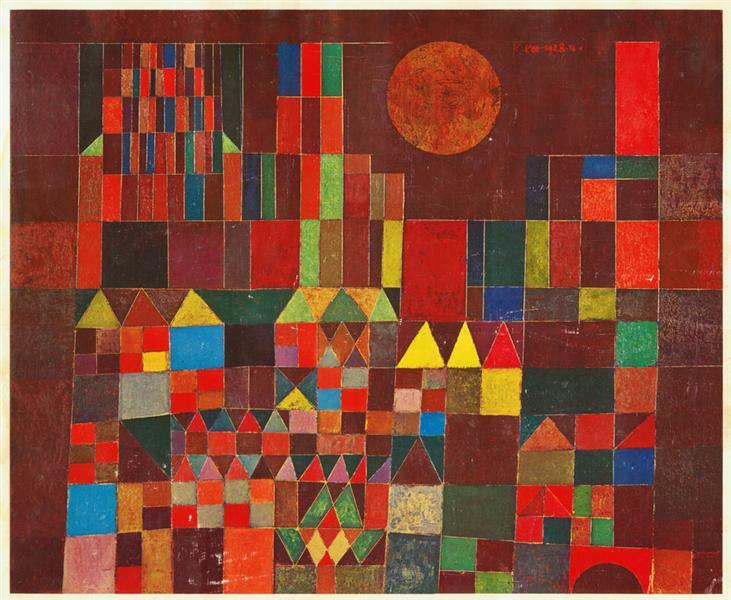 One of the better known of more than 9,000 works produced by Klee, it is among the more famous images of the New York Museum of Modern Art (MoMA). 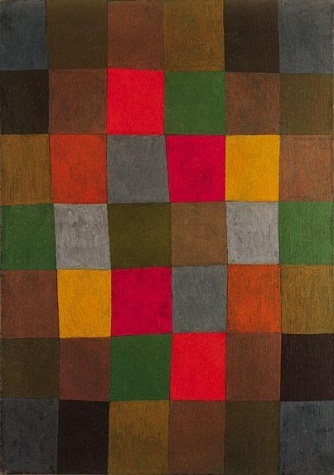 It has inspired several musical compositions and, according to a 1987 magazine profile in New York Magazine, has been a popular piece to hang in children's bedrooms. The picture depicts a group of birds, largely line drawings; all save the first are shackled on a wire or, according to The Washington Post, a "sine-wave branch" over a blue and purple background which the MoMA equates with the "misty cool blue of night giving way to the pink flow of dawn". Each of the birds is open-beaked, with a jagged or rounded shape emerging from its mouth, widely interpreted as its protruding tongue. The end of the perch dips into a crank. 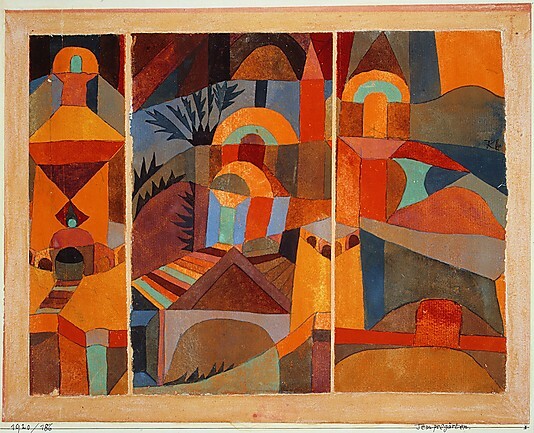 Twittering Machine has invited very different opinions on its meaning, which Gardner's Art Through the Ages (2009) suggests is characteristic of Klee's work: "Perhaps no other artist of the 20th century matched Klee's subtlety as he deftly created a world of ambiguity and understatement that draws each viewer into finding a unique interpretation of the work." The image has frequently been perceived as whimsical, with a 1941 article in The Hartford Courant describing it as "characterized by the exquisite absurdity of Lewis Carroll's "Twas brillig and the slithy toves" and The Riverside Dictionary of Biography placing it in "a very personal world of free fancy". 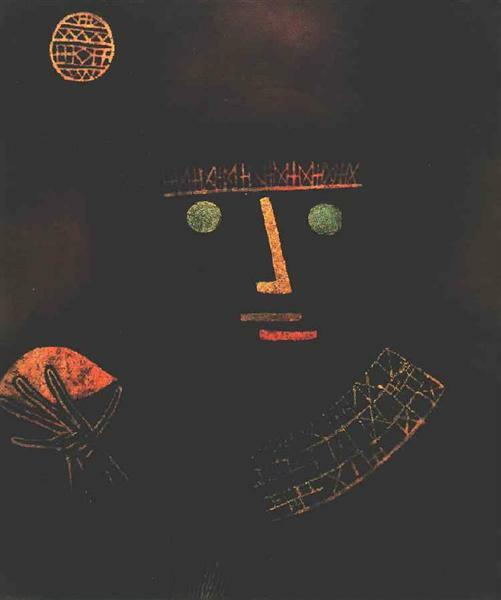 Sometimes, the image is perceived as quite dark. MoMA suggests that, while evocative of an "abbreviated pastoral", the painting inspires "an uneasy sensation of looming menace" as the birds themselves "appear closer to deformations of nature". They speculate that the "twittering machine" may in fact be a music box that produces a "fiendish cacophony" as it "lure[s] victims to the pit over which the machine hovers". Kay Larson of New York magazine (1987), too, found menace in the image, which she describes as "a fierce parable of the artist's life among the philistines": "Like Charles Chaplin caught in the gears of Modern Times, they [the birds] whir helplessly, their heads flopping in exhaustion and pathos. 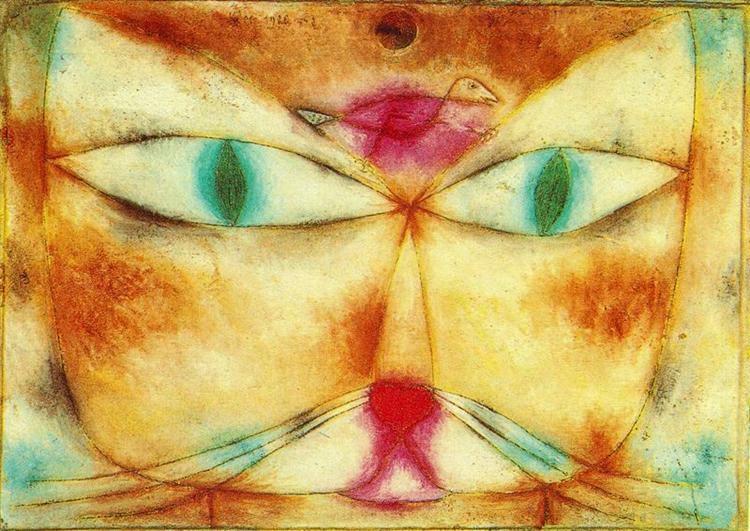 One bird's tongue flies up out of its beak, an exclamation point punctuating its grim fate—to chirp under compulsion."